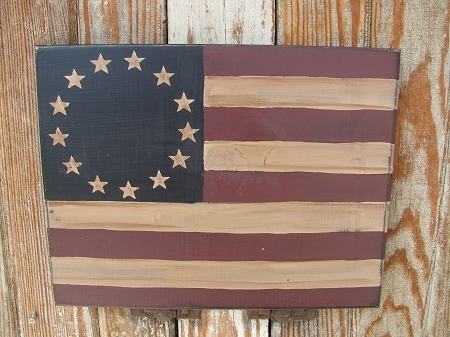 Primitive Americana Betsy Ross flag design wooden sign. Pine wood sign, painted in our nations colors, antiqued around the edges. Colors are a dark navy blue, burgundy and khaki tan (antiqued). Size is 12"x10". Choices of hanging methods. Shown with a sawtooth hanger. Hand Painted by Heidi.